Taylor Tashima sets the ball. 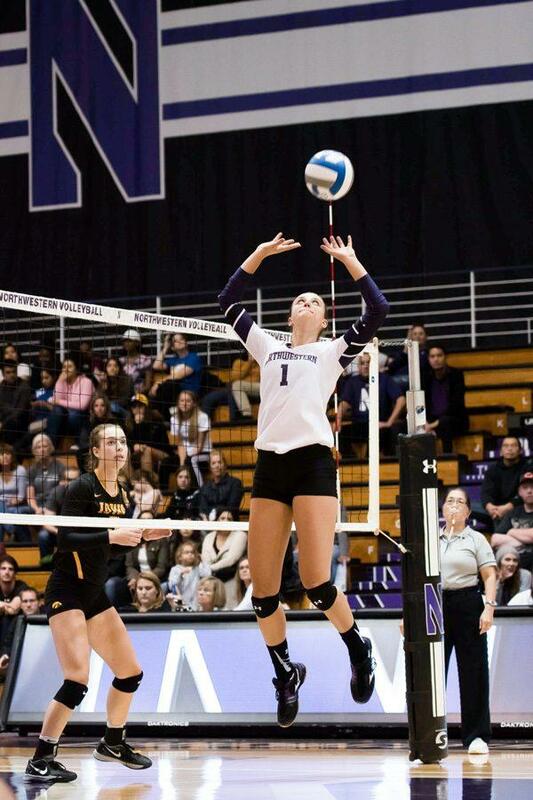 The senior setter and the Wildcats won their first Big Ten match of the season Friday at Rutgers. With 16 matches still left to play, Northwestern has already logged more wins than a season ago. The Wildcats (11-5, 1-3 Big Ten) nabbed their first Big Ten win of the season with a 25-19, 25-13, 25-12 win at Rutgers on Friday, then dropped Saturday’s match at No. 3 Penn State 26-24, 25-14, 25-14. A season ago, NU lost eight straight matches to start Big Ten play. “Overall I’m pretty happy with the weekend, but we still have work ahead of us,” coach Shane Davis said. Despite a slow start Friday due to suboptimal passing, the Cats still forced Rutgers into tough situations defensively. The Scarlet Knights looked awkward and out of position trying to defend, even when NU’s attack didn’t appear as smooth. Once the Cats hit their stride offensively, Rutgers had no answer. NU had a .600 and .542 percent hitting percentage in the second and third sets, respectively. Senior outside hitter Symone Abbott led NU with 13 kills, while freshman middle hitter Alana Walker collected seven and freshman opposite hitter Danyelle Williams tallied six. Abbott added three aces, while freshman libero Lexi Pitsas had two and senior setter Taylor Tashima notched one. Pitsas led the team with 11 digs, while Tashima logged a team-high 32 assists. Over the weekend, Tashima moved up to fourth all-time in team history in assists with 3,648. The momentum from Friday’s match carried into the Cats’ first set against Penn State a day later. NU held a 23-21 lead to start the first set, but the Nittany Lions scored three straight to force set point. The Cats tied it at 24, but Penn State tallied the next two points to win the set. The hosts took control of the match from there. The Nittany Lions opened the next set 4-0 and cruised to a 25-14 set win. They won the third set by the same score. Against Penn State, Abbott had a team-high 12 kills and Tashima led the way with one ace and 31 assists. Sophomore libero Sarah Johnson paced NU with seven digs. Still, Pitsas said the Cats return to Evanston on a positive note. They picked up their first conference win of the season and opened strong against the third-ranked Nittany Lions.